KVK Bathinda organized “Sankalp se siddhi” event in which Associate Director (Trg. ), Dr. J.S.Brar, KVK Bathinda, faculty, supporting staff, field workers took the pledge to work sincerely, dedicatedly and collaboratively for the benefits of poor of the poor, opportunities of self-employment to rural youth after up-skilling them through KVKs trainings, educate women about malnutrition and empowering the women through skill development trainings and double the farming income by adopting the new innovations and technologies. On this occasion Associate Director (Trg.) urged all participants to develop strong linkage with the KVK/PAU to get benefit of improved varieties of different crops and vegetables. He also encourage the natural resource management techniques for the improvement in existing system. 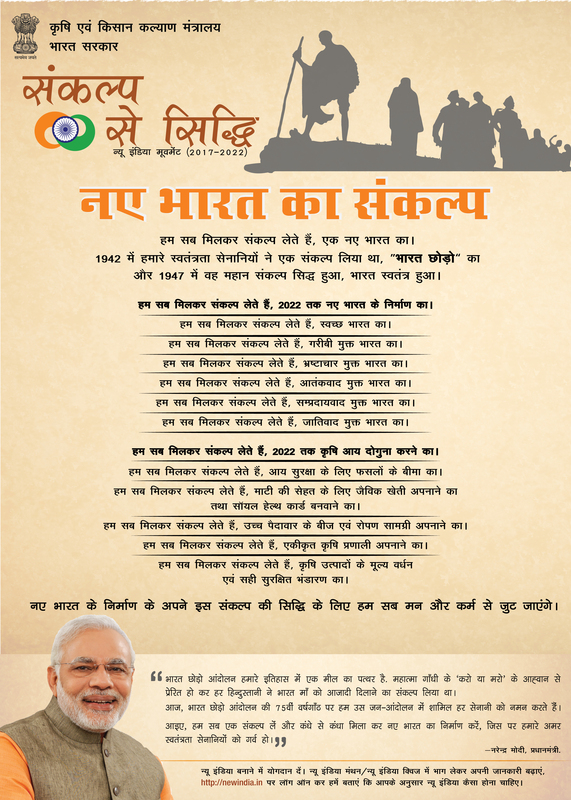 The pledge also ensures Clena India, Poverty & Corruption free India and Terrorism free India. Image: KVK Bathinda organised one day programme on new Indian Manthan- Sankalp se Sidhi. Shrimati Harsimart Kaur Badal was the chief guest of the programme. Image: Krishi Vigyan Kendra, Bathinda organized programme on New India Manthan “Sanklap se Siddhi’’ on 17.08.2017.